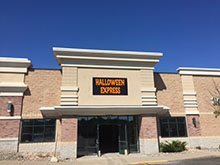 Halloween Express Appleton, Northeast Wisconsin's Halloween costume store, is now open for the 2016 Halloween season. 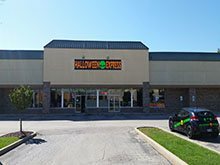 Filled with the best selection of costumes, masks, props, decorations and accessories, we are located on Mall Drive, just south of the Fox River Mall. Welcome to the Halloween Express of Brookfield, WI! 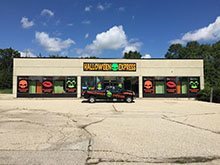 Halloween Express on Capital Drive in Brookfield is ready to help you get ready for the best Halloween yet. Costumes, decorations, makeup, masks, you name it, we have more to offer than anyone else around. Stop in soon for the best selection. Halloween Express of Eau Claire, WI is excited to return for another great Halloween season in 2016. We will once again offer you the best selection of costumes, decorations, masks, make up, wigs, props, and accessories anywhere in Eau Claire. We are located at 4084 Commonwealth Ave., Eau Claire, WI 54701,(next to Best Buy). We are located at the just East of the Oakwood Mall, east of the intersection of Golf Rd., and Commonwealth Ave., in the Former Hancock Fabrics. We look forward to serving you again this season in the Eau Claire, WI area. Stop into Halloween Express, "Your One Stop Halloween Megastore." We are opening for the season on Sept. 10th! Stop by and see us! 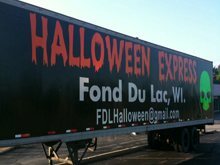 Welcome to Halloween Express Fond Du lac, WI! For the 2016 Halloween Season we will once again be carrying the absolute largest selection of Halloween costumes and Halloween merchandise. Simply put, you won't find a larger selection of costumes, props, decorations, masks and wigs. Serving Fond Du Lac, WI Oshkosh, WI and Ripon WI. We are worth the drive if you are coming from The Fox Valley, Sheboygan WI, Beaver Dam, Wi and beyond. 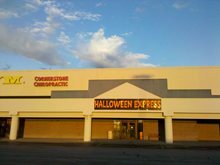 Halloween Express Menomonee Falls, WI! Exciting new items for 2016 Halloween Season. Absolute largest selection of Halloween costumes and Halloween merchandise (costumes, props, decorations, masks and wigs). Close to Milwaukee, WI Menomonee Falls, WI Germantown WI Hartford, WI and West Bend, WI. We are worth the drive if you are coming from Ozaukee County, Washington County, Dodge County, Sheboygan County and beyond. 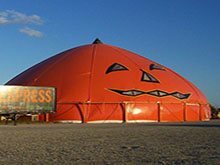 Halloween Express Green Bay is again open for the 2016 Halloween season. Located on S. Oneida Street behind Olive Garden, just 3 blocks south of Bay Park Square and less than 2 miles from Lambeau Field, home of the Green Bay Packers! We carry the largest selection of costumes, decorations, masks and accessories. Come and visit Halloween Express Greenfield located in the Former Office Depot in the City of Greenfield. You will find us just north of Southridge Mall. You will find all the latest Halloween costumes masks, makeup, props, hats and other accessories for adults and children. 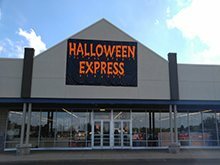 Welcome to Halloween Express Janesville,WI for the 2016 season. Whether its costumes, decorations, accessories, or props, you'll find it here. Stop in to check out the largest selection of Halloween merchandise in the area. We're back in the same location again this year in the Shopko plaza by Taco Bell. See you soon! 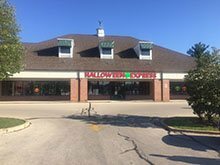 Welcome to Halloween Express Kenosha! 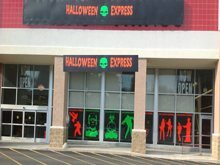 Whether you want to find the scariest masks, funniest costume or the creepiest prop, Halloween Express in Kenosha is the place to stop this Halloween season. We look forward to serving you with the best selection of costumes, props, decorations and accessories. Located on Hwy 50 just east of Hwy 31 in the former BlockBuster, next Dairy Queen. Halloween Express of La Crosse, WI is excited to return for another great Halloween season in 2016. 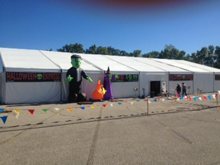 The tent is up and we are excited to be bringing you a great selection of new and classic Halloween costumes, accessories, decorations, makeup, masks and more! Don't wait until the last minute, come see us soon for the best selection. Happy Halloween everyone! We are proud to be your local leading Halloween store for the 13th year here in Madison Wisconsin! We look forward to seeing you again this year. We are located next to Citgo gas station, across the street from Hooters and Hardee's. Goooo Badgers!!!! Happy Halloween everyone! We are proud to be your local leading Halloween store for the 13th year here in Madison Wisconsin! We look forward to seeing you again this year. We are located at the former MC Sports. Next to Home Depot. Right off the Beltline. Goooo Badgers!!! 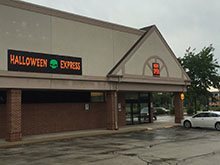 Welcome to Halloween Express Milwaukee, WI! 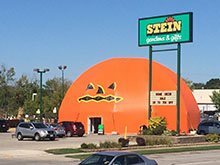 Come shop inside a pumpkin tent filled with the largest selection of Halloween costumes and merchandise in the Milwaukee area. Located south of St. Lukes Medical Center at the corner of 27th and Howard. Conveniently located just off I-94, Halloween Express State Fair Park is located next to the Petit National Ice Center. Look for the giant pumpkin! Our State Fair Park location serves home haunters and would be ghouls in West Allis, Wauwatosa, Waukesha, and Greenfield. Find everything from props and scary decorations to this year's hottest costumes and accessories. Whether you planned your look months in advance or you need to buy a last minute costume on your way to the party you're sure to find what you are looking for at Halloween Express! 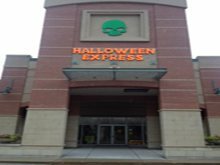 Halloween Express Racine is located in the Mount Pleasant Plaza just across the street from Regency Mall. 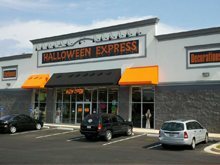 Mt Pleasant, Sturtevant and Elmwood Park residents can find all the latest Halloween costumes and decorations at Halloween Express. Men, women and kids Halloween costumes, masks, make up and accessories are in stock and waiting for you! 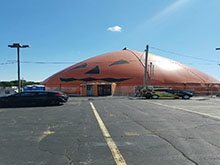 Racine Halloween Express, the areas largest Halloween costume store! Welcome to Halloween Express Wausau! We are located in the Wausau Shopping Center on Rib Mountain Drive next to Barnes & Noble, just 45 minutes north of Stevens Point. Currently open for the 2016 Halloween season, we carry adult and children's costumes, masks, makeup, decorations and accessories. Stop by and shop our great selection today! 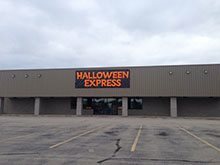 Halloween Express West Bend, WI! Main and Decorah next to Badger Middle School. Exciting new items for 2016 Halloween Season. Absolute largest selection of Halloween costumes and Halloween merchandise (costumes, props, decorations, masks and wigs). Close to Menomonee Falls, WI Germantown WI Hartford, WI and West Bend, WI. We are worth the drive if you are coming from Ozaukee County, Washington County, Dodge County, Sheboygan County and beyond. Welcome to Halloween Express Glendale. Located just East of Bayshore Mall. Be sure to stop by and check out all the latest costumes, masks, make up, props and more to help with all your Halloween needs for 2016.